Good Brother or Bad Brother? This middle school book review focuses on the short story "The Scarlet Ibis." Title: Good Brother or Bad Brother? In the short story, “The Scarlet Ibis”, I think the narrator was a good brother to Doodle. He also did some not so good things for Doodle. One of the first thing the narrator did for Doodle was he gave him the name Doodle. So he didn’t have to have that big long dead person’s name. I think that anyone would like that. Another good thing he did. For his brother he tate him how to walk. That would make anyone feel very good about himself and I thought that made Doodle very happy that his brother wanted to teach him how to walk. And for Doodle to walk in front of his family like his mom and dad and aunt the were very surpprised. Although the reasion the narrator taut Doodle how to walk was so he would be made fun of in school, but it was still good that he spent time with Doodle to teach him how to walk. Then there is the bad thing the narrator did to his brother, and that was when he left Doodle in the rain scared. And to say it was an accedent for leaving his brother in the rain when he was calling brother don’t leave me I’m scared. That’s just such a jerk thing to do. This proves that the narrator was a good and bad brother to Doodle But he didn’t mean to be its just that sometimes people make stupid chocis. And leaving Doodle in the rain was a stupid choice that the narrator made. Good Brother or Bad Brother? by Thoughtful Learning is licensed under a Creative Commons Attribution-NonCommercial-ShareAlike 4.0 International License. 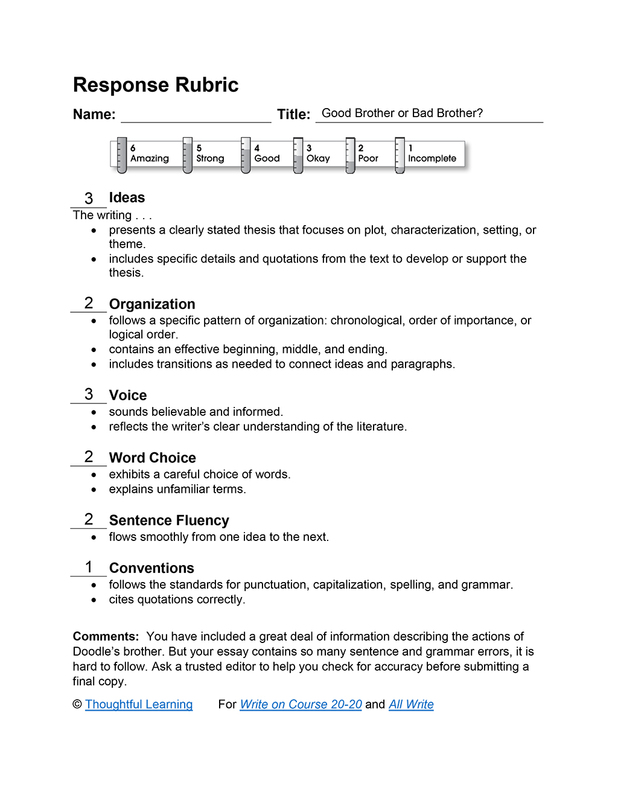 Based on a work at k12.thoughtfullearning.com/assessmentmodels/good-brother-or-bad-brother.